Congratulations! You’ve made the decision to invest in your health and in yourself and get dentures. Missing multiple teeth is challenging and it can take its toll not only on your nutrition and health, but also on your self-esteem. You’ll gradually learn to chew and enjoy the foods you love again, and you’ll appreciate how your confidence is restored immediately. Choosing dentures is a big decision, but it’s one that you will be glad you made! Now that you have your new dentures, how should you take care of them? 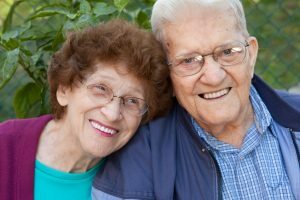 Here are some tips on caring for dentures in Virginia Beach. At first, your dentist may need to adjust and reline your dentures in order ensure the best fit. Once you have a snug fit, you’ll be able to visit your dentist once or twice per year to ensure that your dentures are working for you. Your dentist will examine your mouth to be sure that your gum tissue and tongue are healthy. Your denture can be easily removed for cleaning and sleeping. When you remove it at night it will need to be brushed and cleaned just as you would your natural teeth. Mild soap or a denture cleanser should be used to clean your denture rather than tooth paste, which is much too abrasive and may leave scratches on your denture. An ultrasonic cleaner can be used for dentures, but should not replace brushing daily. When you’re not wearing your dentures, they should be placed in water or a denture cleansing solution in order to prevent them from drying out. If your dentures dry out they may warp, or lose their shape. Never store them in hot water, which can also cause them to warp. Dentures are typically made of acrylic so you need to be careful not to drop your dentures, as they can crack and break. Handling them over a sink or towel for cleaning will help keep them safe. At Smile by Design, Dr. Stephanie Santos and Dr. Vinita Folck have been helping patients restore their smiles with dentures and partial dentures for many years. Our doctors understand what it’s like to struggle with missing teeth and they offer a number of options that will meet your needs. Patients appreciate the high quality dentistry in a warm and friendly setting that they receive from Smile by Design. If you’ve struggled with one or more missing teeth, contact our office today to learn more about how our highly skilled team can help you reclaim your smile.